There's a lesson folks: losses on exports are difficult to ascertain, but the indication are the opportunity for profiting off Ontario's needlessly depressed market rates seems huge and growing. If you haven't read Ontario is the sucker... maybe you should. One story I may, or may not, have gotten wrong is wasted on the traditional territory of the Mississaugas. My piece angered some of the few people I'd rather not anger, but clearly we aren't recognizing increased hydroelectric generating capabilities because we can't take all the power while the political power in the Province can exercise the power to complete a line intended to move power more efficiently to the border area at Niagara. Numbers are attached to the foregone hydroelectric too: 3.2 we couldn't use, 1.9 of which OPG will get reimbursed through our rates. As dispatching hydroelectric units down to reduce production is the first measure the IESO uses to manage SBG, OPG’s hydroelectric generation was significantly affected, reducing generation by approximately 3.2 TWh in 2014. 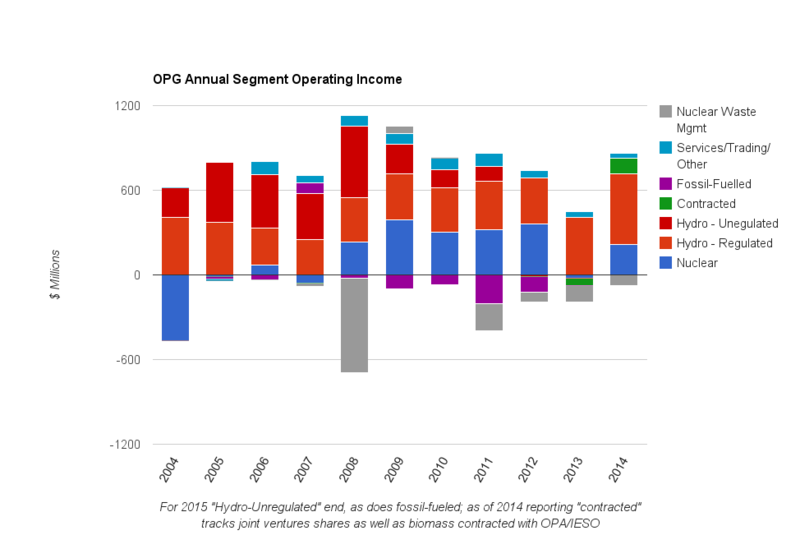 The net income impact of SBG conditions on OPG’s existing regulated hydroelectric stations and, beginning November 1, 2014, the newly regulated hydroelectric stations was offset by the impact of a regulatory variance account. Of OPG’s 3.2 TWh of lost generation due to SBG conditions, the volume that was offset by an OEB-authorized regulatory variance account during 2014 was 1.9 TWh. That 3.2 TWh avoided represents 10% of what Ontario could have generated with it's publicly owned hydroelectric generating units. The IESO put out contracts for more variable intermittent suppliers this week. I tried to ignore it but arrggghhhh. 3.2 TWh of hydro spilled in 2014; a year the IESO reported wind generated 6.8 TWh - and that reduced by 4.6% from what we paid for, due to curtailments. I'd be more inclined to aske the IESO exactly how much generation was curtailed in 2014, but I doubt they'd know; there's no indication they've even approached a clue on what solar generated, but there is strong evidence they can't forecast demand on a sunny day. This extraordinary items "income" is all me ... and Parker Gallant ... and fuzzy accounting. OPG recognized an extraordinary gain of $243 million in 2014 related to the forty-eight hydroelectric facilities, which were prescribed for rate regulation beginning in 2014. The gain relates to deferred income taxes expected to be recovered from customers through regulated prices in respect of these newly regulated facilities. Effective November 2014, OPG receives new regulated prices for its regulated facilities, including regulated prices for the forty-eight hydroelectric facilities. I'm willing to share responsibility. In fact, I'd be good with a 10% cut of the proceeds. Parker Gallant would know what's fair better than I.
note: Parker, can you handle arranging this, and let me know when I can start spending? Thunder Bay, now running infrequently on a different biomass (advanced biomass), instead of generally not running on coal, after spending $7 million. Converted thermal generating stations can provide Ontario’s electricity system with continued flexibility of daily start up and shut down, load-following capability to meet changing system needs, and complement non-dispatchable renewable energy sources. The activities required to preserve this option are reflected in the Services, Trading, and Other Non-Generation segment starting in 2014. 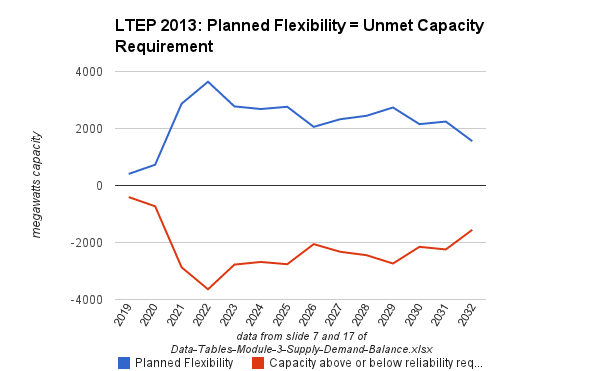 OPG is seeking recovery of ongoing costs to preserve the option to convert the units. If recovery is not allowed, OPG will consider all options regarding the future of these stations, including full site closure and decommissioning. The decision to continue to incur preservation costs, in the absence of a cost recovery mechanism, will be revisited in the first half of 2015. Should OPG find a way to maintain the assets, and its accountants ratchet up the balance sheet assets to reflect the ongoing utility, I expect to be remunerated for this work just as I've been on the hydroelectric regulation changes now benefiting OPG. One of the interesting aspects of the OPG results for 2014 was the cost of fuel for their hydroelectric production. In 2014 they paid fuel costs for water (page 33 of the annual report) to the province that came to $325 million exactly the same amount as 2013. Looks like the province raised the tolling costs for water that IESO are often obliged to tell them to spill. Kind of a double wammy to ratepayers with the loss of that 3.2 TWh! On another note the Thunder Bay conversion only mentions the $7 million cost and doesn't include the prior costs for Union Gas to run a pipeline to them. I visited this Brad Duguid directive of August 17, 2011 in a post in Energy Probe on November 24, 2013 wherein I cited a newspaper article that suggested it would operate at a 2% of its capacity. Before they go the full route on conversion of the coal plants I would like to see the numbers!